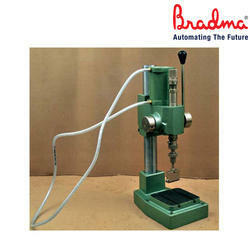 Leading Manufacturer of bradma impact press from Mumbai. Easy to adjust impact force. Automatic compensation for different workpiece thickness (note Airline Pressure is only compressing the spring - not for determining impact force). Highly Versatile Ideal for Light Assembly Work and for Sheet Metal Work¿¿ (Riveting, flaring, Piercing, Shearing, Bending plus many more operations).